As I glimpsed yesterday, Trump's first press conference brought a pretty bearish tone to the market. It was a speech full of indefinitions, vagueness and phrases, without giving details, for example, of its fiscal policy and taxes. This translates, in today's opening, into a strong sell off: SPX at -0.80%, all sectors in red, treasury bonds up and dollar /DX down (-0.77%), losing in front of all his world pairs. The worst day of the market since October, until now. We will see tomorrow, Friday, if the earnings of the big banks (JPMorgan JPM, Wells Fargo WFC and Bank of America BAC), confirm the Trump rally. It is foreseeable that, at the beginning, the position will be great for Trump. Because of this the tone of his speech will have to change: stop being as media and exaggerated as in the campaign and take the profile that his position requires. When you officially take office, you will be required to make specific and unambiguous definitions. Hopefully change your style because I perceive a great disappointment on Wall Street, translated today in the results. Of the little concrete thing that said yesterday Trump, the health sector XLV, that came improving, was the most beaten when criticizing strongly to the pharmaceutical sector IBB ('drug-makers are getting away with murder'), reason why I think it is prudent to avoid this sector until having more precise definitions. Read more here. It´s not the first time that a Trump twit stir the markets. Health sector, the new victim. A couple of notes for the mid term: The technology sector XLK is coming, slowly but surely, to the high levels it had in the dot-com years. It took 17 years to do it, and unlike those years, this time with very solid foundations and companies like the FAANG (Facebook, Apple, Amazon, Netflix and Google) leading. Attentive to that level of resistance, which this year can be broken. 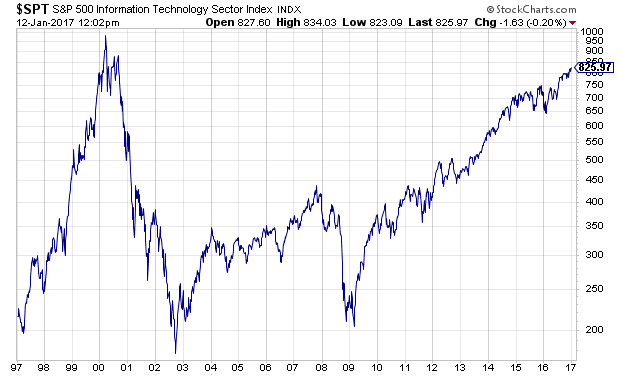 The technology sector, 20 years after the dot-com bubble, now near those record highs. Bitcoin, the digital currency, increasingly sounds on Wall Street. It had a meteoric rise in its 'value', but also a lot of distrust and disbelief, since it was created in 2009. Banks today are taking it more and more seriously, and there are already funds interested in creating etfs for trading on the NYSE, as you can read here. For the moment you can follow its evolution with the NYXBT index. To take into account for this 2017, with risk management. 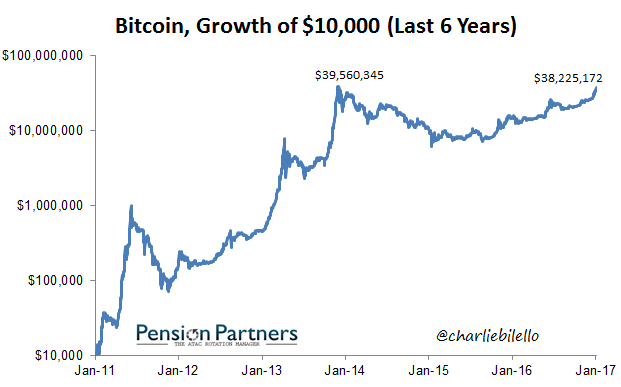 Be careful with the bitcoin and the bubble its creating. © 2018 Greed and Fear. Is not responsible for the results obtained in your trades. Powered by Blogger.